Love that first dress, what a color! So stylish! i love that you speak out about your animal advocacy! i volunteered in an animal shelter for a few years, and there are so many precious animals that need homes. my dog is from a rescue and he is the sweetest, smartest dog. anyway, love your new maternity dress too! beautiful color. You are so brave to volunteer in a shelter! I'd get too attached and want to take all of the animals home, haha! :) I strongly believe in adoption, like you said, so many gorgeous animals just waiting for a new home. First off your bump is adorable-- and that dress will definitely come in handy for nursing - trust me, I am speaking from experience! As for you second look--- I am super fond of the tee and what it represents. Love when fashion can join with a message! Thank you! I'm glad you think the dress will be great for nursing too, makes me feel I picked well! great outfits! and what a beautiful handbag collection ...marc jacobs and balenciaga...oh my!! :-O i'm envious!!!!!!!!!!!!!!!!!!!! That burgundy dress is so lovely on you! pregnant and wonderful! you're so gorgeous!!!!! the color and style of the dress look amazing on you Mica. so sweet of them. love your tee and what a great cause. Oooooh, love the maternity dress! Such a lovely burgundy color. hehe, yes I can't resist my Oscar's Law tees! love the shades of purple in that first outfit :) and that balenciaga mini is so cute! wow love the color palette of your first look! I love the maternity dress. That is fast shipping indeed! 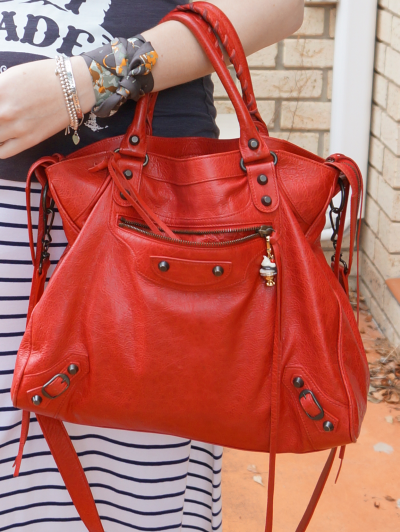 The red bag is beautiful. 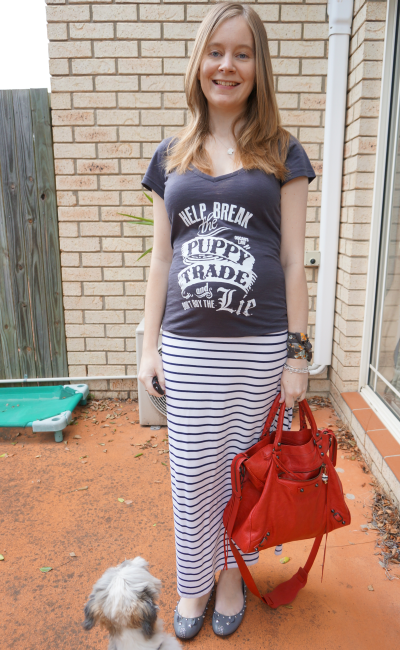 The dress is beautiful on you and I really love the message on your tee! You look absolutely stunning! Congrats on the baby news, that must be really exciting :) By the way, I love the Marc Jacobs bag. I've been meaning to get one but I always hesitate because of the price! I think the pink blush is one of the nicest maternity dresses I've seen...wish I had known about it 9 months ago! That color if beautiful too. Congrats by the way! How very exciting. Your friend K is spot-on. 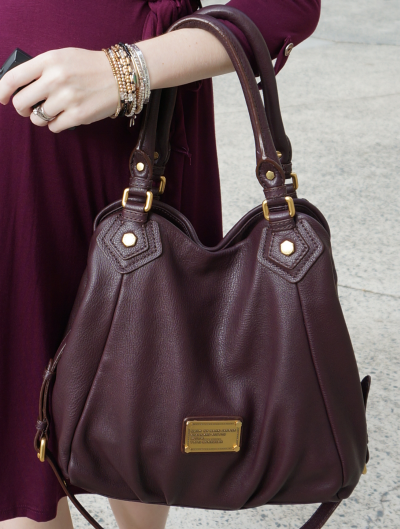 The tonal berry shades (dress, handbag) are modern and chic. I just had to come search for the Fran bag on here, which is probably not good because it just makes me want it more! Does it look more reddish/wine in real life, or do you think it looks more brown?